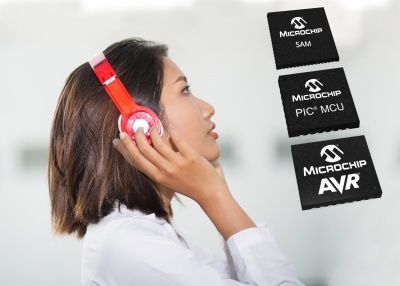 Microchip Technology Inc. announces a new 2D Touch Surface library that enables designers to easily implement touch pads using the company’s 8-bit PIC® and AVR® microcontrollers (MCUs) and 32-bit SAM MCUs. Available free of charge with the purchase of any compatible MCU, the library provides a simplified, low-cost solution for embedded applications. Ideal for implementing small touch pads and screens, the 2D Touch Surface library eliminates costs by running on a device’s existing MCU. This removes the need for a dedicated touch controller, giving product designers the flexibility to add finger position tracking and gesture detection, such as swipes, pinch and zoom, to products. The touch library is provided through Microchip’s code configurators: MPLAB® Code Configurator (MCC) for PIC MCUs and Atmel START for AVR and SAM MCUs. Both software tools enable simplified graphical configuration and accelerate development with lean C code tailored for individual project needs. The 2D Touch Surface library is available today on Atmel START and will be available on MCC this quarter. Intuitive, attractive user interfaces are central to the success of products, and the 2D Touch Surface library eliminates the need to integrate a costly operating system to fulfil consumers’ smartphone-like interface expectations. The library is well suited for adding touch to a variety of applications across consumer electronics, automotive and industrial industries, such as smart speakers, steering wheels or thermostats. Low-power performance for touch pads is built-in through the library, as complete surfaces are scanned at once while in deep sleep. Reliability is a fundamental requirement for touch, and the solution provides continued responsiveness and functionality through the impact of water and noise, meeting the demands of automotive and home-appliance applications. Implementations operate through wet conditions and can sustain 10V in conducted noise, in alignment with International Electrotechnical Commission (IEC) 61000-4-6 test level 3. The DM080101 Water Tolerant Touch Surface development kit enables easy evaluation of the 2D Touch Surface library. The kit demonstrates water tolerance and noise immunity on a touch pad and has two touch buttons, all controlled by the same MCU. The 2D Touch Surface library is available for free with the purchase of any compatible MCU. The DM080101 Water Tolerant Touch Surface development kit is available now for sampling and in volume production.